EnduroShield® is perfect for glass BALUSTRADES. The permanent* non-stick coating will protect the glass against corrosion and etching from contaminants such as sea salt, dirt and grime, reducing cleaning time by up to 90%. Untreated glass is porous and as a result it absorbs contaminants which can lead to deterioration, etching and discoloration. This makes it more and more difficult to clean and maintain the glass. 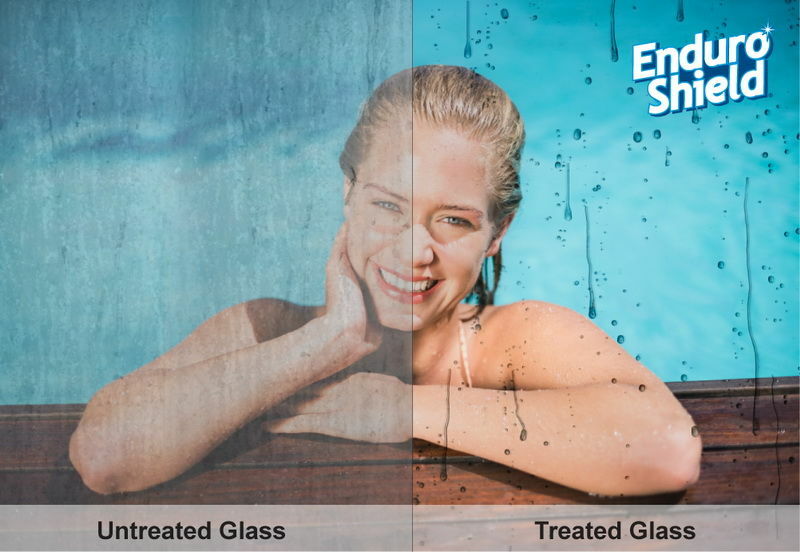 EnduroShield is an ultra-thin transparent coating that completely adheres to the glass surface and provides protection that will repel both water and oil based stains. Similar to a non-stick fry pan, cleaning is made easier using only water and a mild detergent or with a microfiber cloth. For best results, use a squeegee to remove and water drops from the glass after cleaning. EnduroShield makes cleaning a breeze. It will also keep the glass looking cleaner for longer in between cleans! 'Once Only' Application - permanently* bonds to the glass. Extensive testing has proven EnduroShield to last beyond 10 years, enabling a genuine 10-year warranty on all new glass railings. A 3-year warranty is provided for application to existing glass railings, however this does not infer the coating will stop working after this period. Based on 10 years of simulated normal use and certified by TÜV Rheinland, Germany.